New York Islanders: Is a Move to Brooklyn or Pilgrim a Likely Scenario? With the New York Islanders’ lease running out in 2015, there have been many rumors regarding a possible move out of Nassau County. Areas such as Kansas City, Quebec, Las Vegas, and Seattle have all been thrown in the mix as possible landing spots for the Isles if they were to move out of Long Island. However, with the Islanders scheduled to play an exhibition game in the Barclays Center against the Devils, many fans will be able to see what comforts (or lack thereof) the newly constructed arena will have to offer the Islanders and hockey fans in general. While any relocation from Nassau County by the New York Islanders would not be well received by their fans, Charles Wang must consider each and every one of his options before taking the next step forward. Being that Wang amassed his fortunes on Long Island, it is more likely that the owner will exhaust all of his resources to stay on Long Island before considering a move elsewhere. The possibility still remains that the New York Islanders can be shipped out of New York State, but there are still a few major factors that could provide the Islander’s faithful with a glimmer of hope. At first glance one might consider the Islanders moving to Brooklyn as a counterproductive move since Brooklyn is predominantly the territory of the Blueshirts, right? Well, that may be true, but only to an extent. The New York Rangers have a vast fan-base throughout the five boroughs (Manhattan, Staten Island, Brooklyn, Queens, and the Bronx) and are commonly viewed as the pillar of hockey in New York, but there are fans of every variety in Brooklyn and New York. New York is a giant melting pot and it is not surprising to see fans walking the streets of Brooklyn wearing Devils, Red Wings, Sabres, and Islanders gear. One is most likely to see an individual roaming the streets of New York in Rangers attire, but the fact still remains that there are fans living in each of the five boroughs that root for a hockey team aside from the New York Rangers. 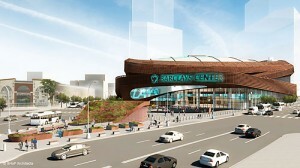 With the New Jersey Nets relocating to the Barclays Center in September of 2012, the Brooklyn area will receive its first professional sports franchise since the departure of the storied Brooklyn Dodgers. The arena will cover a small portion of the MTA’s Vanderbilt Yards and is located in an area that experiences a significant amount of traffic on a daily basis. A move to the Downtown Brooklyn area would provide fans with an opportunity to shop, eat, and enjoy the various venues around the arena, something that isn’t afforded to fans who are left to trudge the sea of concrete after exiting the Nassau Coliseum. After all, who wouldn’t want a slice of Junior’s famous cheesecake after watching an exciting sporting event? While the area surrounding the Barclays center is one thing, accessibility is another important factor that should be considered. Many New York Rangers fans get to Madison Square Garden via the MTA, the LIRR, or some form of mass transit. Unlike the area in Hempstead, the area surrounding the Barclays Center is a major transportation hub as there are MTA and LIRR subway lines as well as many buses that can provide adequate and cheap forms of transport. Getting to the Barclays Center via automobile will present challenges for some (much like at MSG) as parking is very hard to come by and parking lots around the area will charge exorbitant numbers once the Brooklyn Nets become permanent residents. The idea of a professional basketball team and a hockey team sharing the same arena is not so farfetched since the New York Rangers and New York Knicks share Madison Square Garden. Back in the 1970s, the New York Islanders and the Nets shared Nassau Coliseum, so who is to say that they won’t be able to become tenants in the same arena again? Moving to Brooklyn would present the New York Islanders with a couple of dilemmas. For one, the Islanders’ fan-base is deeply rooted in Long Island and despite poor attendance figures over the last few years, there is definitely a hockey culture on Long Island. A potential move to Brooklyn might encourage more Long Islanders to sit at the comfort of their couch and watch their hockey team on T.V instead of making the journey to Brooklyn. Even though one can take the LIRR from virtually anywhere in Long Island to the Barclays Center in Brooklyn, the trip could take in upwards of two hours depending on how far a person is located on Long Island and the number of transfers the individual will have to make in order to get to the Downtown Brooklyn area. In addition, many people have pointed out the fact that the Barclays Center would only hold a capacity crowd of 14,500 for a hockey event. A full capacity of less than 15,000 people would make the Barclays Center the smallest NHL arena in terms of fan seating and many have argued that an arena built for a basketball team would make for some pretty poor sight-lines for hockey events in the same building. However, with the Islanders’ lease expiring in 2015, Bruce Ratner and company will have almost 3 years to decide if changes should be made in order to accommodate the Isles’ potential relocation to the Barclays Center. 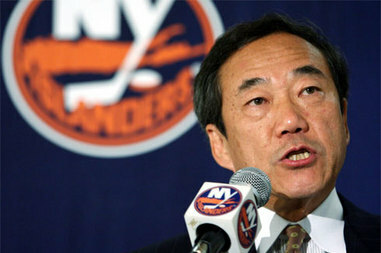 While a move to Brooklyn would certainly be news to the New York Islanders and their fans, Charles Wang will probably do whatever it takes to make sure that his team stays in Nassau County. Until Nassau County shows that they are wholeheartedly against the Islanders staying in Hempstead, there is still hope that the franchise will not have to leave its one and only home. Located in Suffolk County, the area of Pilgrim gained notoriety because of the Psychiatric Centers that were set up in the area during the early to mid-1900s. In the modern day, the scale of the Pilgrim Psychiatric Center has been massively downsized and some of the area that belonged to the Psychiatric Center now houses a part of the Suffolk County Community College campus. If the New York Islanders were to move to Pilgrim, the most striking difference for fans would be the fact that the Isles would be relocated to a different county. Long Island is split up into two counties (Nassau and Suffolk), with the former having some of the highest local taxes in the nation. Former County Executive Steve Levy made it known that Suffolk County would welcome the New York Islanders if Wang’s bid to develop the Nassau Hub fell through, but the election of new County Executive Steve Bellone makes the aforementioned discussions somewhat of a moot point. However, Pilgrim still makes for an interesting site since the area is largely undeveloped and the presence of a professional sports franchise would undoubtedly bring growth to the surrounding area. Furthermore, with the Sagtikos Parkway and the Long Island Expressway minutes away from Pilgrim, an arena in the area would be just as easily accessed as the Nassau Veterans Memorial Coliseum. Some might fret that a move to Pilgrim would make it harder on Nassau County residents to make the trip out to Suffolk, but the trip from Hempstead to Pilgrim would take about 20-30 minutes if traveling by car. Also, Suffolk County residents have been making trips to Nassau to root for the Islanders for decades so it is inconceivable to believe that a whole County will shun a team if they move a little deeper into Long Island. Much like Hempstead (Nassau County Community College/Hofstra University), the area in Pilgrim has a college and a university (Suffolk County Community College/Stony Brook University) that are close by. While droves of students would not be expected to fill the seats in a stadium, the location in Pilgrim would make it a fair trip for those traveling from either Nassau or Suffolk County. Since Pilgrim is easily accessible by highway, there should be no qualms over a possible team relocation to the area. Simply put, if Suffolk County residents made the trip to Nassau County since the 1970s, then Nassau County residents could make the trip to Suffolk County to support their beloved team. Besides, if the area is developed and the Islanders move to Pilgrim, the arena nicknames would be endless. With nicknames such as “The Loony Bin”, who would not want to go see the Islanders play in their new arena? Since there is an exhibition game scheduled between the Islanders and Devils at the Barclays Center, Brooklyn seems to be one of the candidates that could be offered to house Long Island’s only professional sports franchise. Technically speaking, Brooklyn is a part of Long Island and the team could retain its name and logo if they were to move out to New York’s finest borough. GM Garth Snow has expressed his excitement about the Islanders playing in a state of the art building and it will be interesting to finally see if the Barclays Center is a suitable arena for hockey. If it turns out that the Barclays Center is an acceptable arena for a professional hockey team, then there might just be a new market for the Islanders and an expansion of the fan-base is not out of the question, especially in a densely populated area such as Brooklyn. With many arena questions surrounding the Islanders, there will undoubtedly be many suitors that would be willing to take on the franchise if Nassau County does not want to extend their courtesies to the Isles. While a project in Pilgrim is very feasible, it is yet to be seen what route Charles Wang will take if he is unable to break ground with Nassau County. However, the Islander’s faithful must remain hopefully optimistic that the New York Islanders will not move out of the Hempstead area. The loss of Long Island’s only professional sports franchise would be devastating not only to the fans, but to the economy of the County, which would lose revenue from the 41 games not being played at the Nassau Coliseum by the New York Islanders. While there may be an immense amount of uncertainty surrounding the Islander’s future in Long Island, ownership and management have shown the fans that they are committed to restoring the franchise to prominence. Long Island needs the Islanders, but the Islanders also need their fans to stay dedicated and optimistic through all the turmoil.